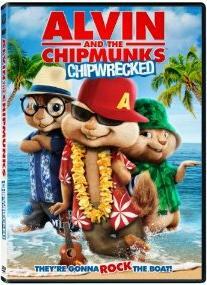 This holiday season, the Munks are about to unleash their greatest, grandest and most spectacular adventure: ALVIN AND THE CHIPMUNKS: CHIPWRECKED, in which the vacationing Chipmunks and Chipettes are turning a luxury cruise liner into their personal playground, until they become ‘chipwrecked’ on a remote island. As the ‘Munks and Chipettes scheme to find their way home, they accidentally discover their new turf is not as deserted as it seems. The new film has it all: Alvin running amok on a luxury cruise liner; an epic salsa dance face-off, an erupting volcano, anthropomorphized athletic equipment; a mysterious castaway; the Munks and Chipettes hurtling through the air via runaway kites and makeshift zip-lines – and the hottest Munk-ified music ever. It’s Alvin, Simon, Theodore, Brittany, Jeanette and Eleanor as you’ve never seen them before.